Below are 16 photos from this past weekend — thanks to Skeeter and Taylorbug for sharing these great photos! Credit goes to Skeeter for the first six photos below and Taylorbug for photos seven through sixteen. Thanks again to both! You know….looking at these pictures, it looks as though it is great to be Taylor, right now! Love pic #7…and there is something about the last one that sends shivers up my spine….boots, yeah! Please tell….what did Taylor say about the picture your son-in-law did? In the #2 pic, Bill looks like he’s wiped out. Tough being the flashlight holder! Man, those boots…. just think…. inside those boots, his feet are bare……*cough*………and that grin in #7 is to die for. This is a great year for him so far, and you can tell just by looking at him- way to go, Taylor!! Number 7 is nice all right, but I’ll vote for number 10. Oh, yes…. #7 does it for me. Wow.. a man of many jackets. I love the tee shirt – jacket look. It must be a hard job being the flashlight holder. If Bill ever gets tired, I volunteer to take over. Nice boots also… the bedazzling on the tips caught me off gaurd at first though. Awesome pix ladies. Thanks so much. What great shots!!! Thank you Skeeter & Taylorbug & our favorite Bloggerina. If I really had to pick one, I guess it would be #7 but I love them all. Hmmmm, the boots….’nuff said. Oh man, I love that leather jacket….whew…. Ah man, those boots and leather jacket! He wears them soo well. Great pics! Cool & collected. Great pics. I don’t usually comment even though the themes and pics are absolutely EXCELLENT! Bravo….ok, but the boot shot just intrigued me. You can actually see the wear marks of where his toes are…maybe it’s the light but what a cool pic. What great pictures!! I saw Grease in Cincinnati and was praying/hoping/wishing that he would perform WRIR after the hsow-but alas!-he did not. However, the show was great-Taylor got the greatest ovation of the evening-and it did my heart good to note that everyone in the theater seemed to know who he was-and acknowledged him. Afterwards-I overheard someone say “He won American Idol?-he seems better than that show?”-which I also LOVED. An overwhelming sense of the generous spirit of others filled my thoughts as I viewed today’s assortment of stunning photos. Skeeter and Taylorbug – Bless you for sharing your Taylor experience through beautiful photos. Not only do they let us gaze upon this gorgeous man, but they also capture the fellowship of friends. Friends I wish I could meet one day. Bloggerina – To be able to come to RHS and find the gems you post has warmed my heart and fed my soul. Your efforts are truly remarkable. Posters – You brighten my day with your observances. Boots, leather, and lashes Oh, yeah! Taylor – Your accessibility amazes me! What you do for your fans – your time, energy, and sincere appreciation – will never go unnoticed or be taken for granted. We need more info about the picture being held up in photo 14. It looks very cool. “A man of many jackets.” Haha! I like that, Trixi. Wonder where he keeps all of them on the road? Do they travel by bus with this tour? And yes, I’d love to know what Tay said about that huge poster. Such gorgeous photos! Each and every one of them. Wow! It’s a painting. Really nice. Thanks, Harp. Dropped dead because of photo #10. My god, that man in leather! Ladies, I hate to burst your bubble but that shiny black jacket is not leather. It is like polished cotton. I know because I got a big hug at the M&G. In any case, it IS gorgeous and so is he!! Taylor sure looks cute in his Nike hoodie. This is the second Nike hoodie we’ve seen him in. It sure makes me wonder though . . . is Taylor’s long, love affair with New Balance doomed? How is New Balance going to feel when it finds out that Taylor has been seen out on the town with another brand? I’m still trying to figure out how I can claim to be a “normal, not obsessed fan” while still knowing what brand of sneakers he prefers. Handsome as always. I like the one of Taylor on the street, VERY serious! Thanks for sharing! Considering the amount of flashes going off after the show, I’m kind of surprised there are not more pics on the net by now. Happy to have a bunch here! So, that must be the jacket he wore at the July 4th thing in Washington…we all thought it was leather but later he said it wasn’t. Thats a painting? It looks really cool, did he like it? That painting is awesome. Taylor seems to like it. Love 5, 10, and 14. And the boots are great. ok, I have a funny story about the painting. It was done by Pat Boyers’ son in law. It is really huge, about 5 feet wide. Of course he got it! There was someone at the M&G with a pink mohair sweater on. Taylor was cuddling up for photos. 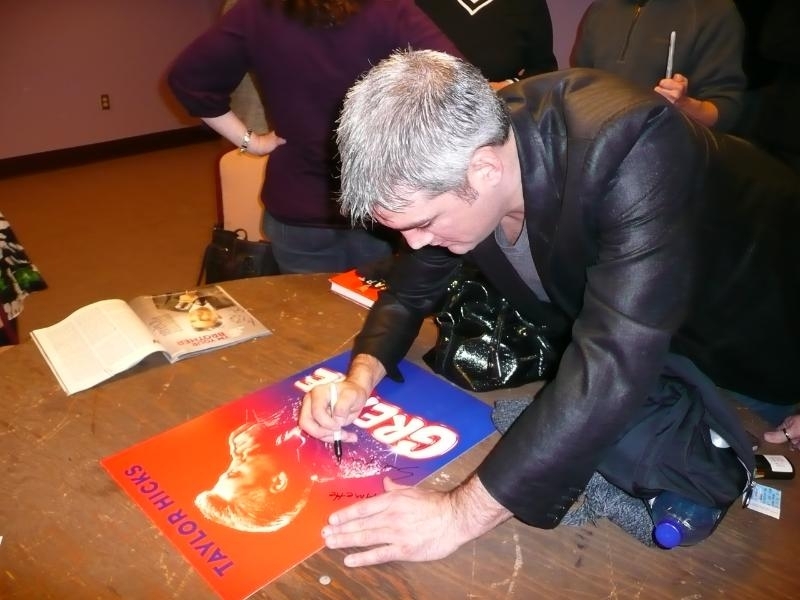 So when he was signing the painting, I noticed that he had pink fuzz all over the back of the black shiny jacket. I happened to have a lint roller in my purse……. Bill had told us that Taylor had to hurry up the M&G because he had a TV interview to do. So I asked Bill if I could use the lint roller on Tay because I didn’t want him to go to the interview like that. Bill said, “No, he has someone to do that in wardrobe.” Someone in wardrobe is so lucky! If you can believe it, it was just the mother in me. I keep looking at the angle in #11 and laughing because it’s like an optical illusion to me — it looks as if Taylor is one of those cardboard cutouts that they use for people to stand next to and have their picture taken with a celebrity lol. I love all the pics today. Thanks to Skeeter and Taylorbug for them and to TaysH for posting them here. hee hee, you’re right, LindaT, #11 does look like cardboard Taylor.The pictures are all great .Thanks to Skeeter and Taylorbug for sharing and TH for posting. All great photos today! I especially like 7,8, and 9! Love him in his Nike sweatshirt! The one of his boots is really cool too. Special thanks to these ladies for their generosity in sharing these wonderful pics with us! As always, thanks to TH! These photos are wonderful memories from the Baltimore/Annapolis TH weekend. Thanks so for posting them, Skeeter and Taylorbug.